Gertrud and Otto Natzler were leading figures of West Coast ceramic production in the mid-twentieth century. 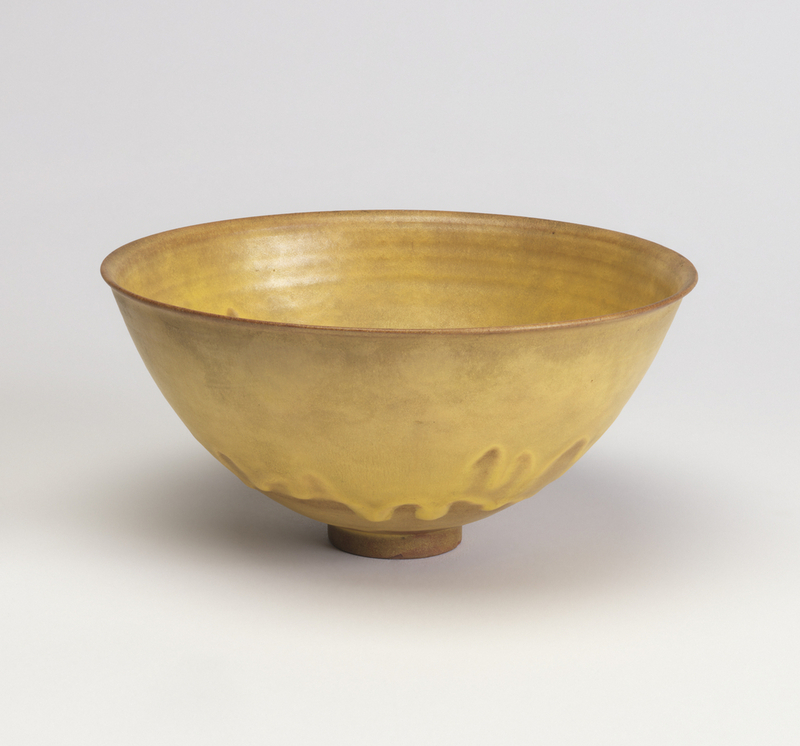 This bowl, as well as two other Natzler pieces, were donated by the granddaughter of the original owner, Friederich Rotter, who met the Natzlers in the 1930s through his Vienna-based home furnishings business and gallery, Der Wohnraum that sold the couple’s ceramics. The Natzlers and Rotter both left Nazi-occupied Vienna and settled in the United States where their friendship continued and this bowl was made. In 1938 the Natzlers arrived in Los Angeles where they set up a ceramics studio and worked side by side until Gertrud’s death in 1971. Gertrud threw the forms while Otto conducted extensive experiments with glazes, devising over 2,500 throughout his career. This bowl exhibits Gertrud’s skill in achieving thin walls and a delicately balanced form. Otto’s glazes involved rounds of applications by brush so that he had complete control over the building up of the surface. He kept a record of every trial and error. Here the yellow drips over a deeper red under layer allow us to see a few stages of Otto’s glazing process. The couple’s pieces never exhibited any pictorial decoration; instead the composition and color combinations of the glazes as well as the texture of the clay medium itself provided the visual interest for their simple yet alluring work. Although the Natzlers would often repeat a form or a glaze, such as the color yellow that they favored, every piece was a variation on previous designs and the couple never produced duplicates.